DARTMOUTH – Once a month, Lloyd Center Educators arrive in Quinn Elementary School’s third-grade classrooms armed with props, worksheets, activities and other materials. Why? To teach the children about birds. Through birds, students are exploring basic concepts of life science such as food chains, predator/prey relationships, adaptations, migration and extinction, life cycles, and habitat use. These third-grade students are learning, in a hands-on series of experiences designed to introduce them to the dynamic and complex ecology of birds. The program, Feathery Focus, focuses on identification of local birds, physical characteristics, and behaviors to teach these scientific concepts. During the first Lloyd Center visit, students participated in a lesson to learn just what a bird is and were taught about a bird’s skeletal, organ and sensory systems. With a large drawing of a bird hung upon the board, students were each given a prop representing a bird’s body part. One by one, body parts were discussed, and student’s velcroed their “body part” prop to the drawing, creating a very funny looking, exaggerated bird which helped them to remember all of the characteristics unique to birds. The second unit that students studied was a bird’s habitat, its description and use. Students learned that birds need to find enough food, water, shelter, and space within their habitat. If there is a shortage of any one of these things, birds may have to leave the area in order to survive. Students participated in an activity searching for food, water, and shelter, and discovered how and why these things may be in short supply – droughts, fires, or human activity. items are present throughout different seasons. The Feathery Focus Program consists of nine units taught by Lloyd Center staff, several units led by the classroom teacher and one field trip that will provide a comprehensive presentation of scientific principles. Every third grade class at Quinn Elementary School spends 45 – 60 minutes on each unit with one unit covered each month of the school year. Typically, each unit begins with a brief sharing of recent bird sightings, a quick review of the previous unit(s), followed by an introduction to the day’s topic. 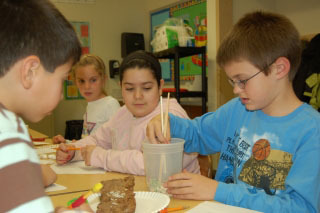 The activity the students participate in may involve individual work, small group participation, or team approaches. Over the coming months, the students will study a birds’ discriminating field marks; feather parts, functions and types; bird identification; life cycles; bird songs; migration; bird science; what does ornithologists do, and bird nests. After successfully completing the program, students will have a better understanding of the species diversity of birds within their community, how species interact with the environment, how birds are adapted to their environment (beak, feet adaptations, coloration) and hopefully will become interested in birds and the natural world. The Feathery Focus program has been incorporated into the year-long standing science curriculum for all third grade students in Dartmouth. In addition, the program is also taught in Westport, Fairhaven, and Fall River. To learn more about the Lloyd Center for the Environment and its Feathery Focus Program, log onto www.lloydcenter.org.